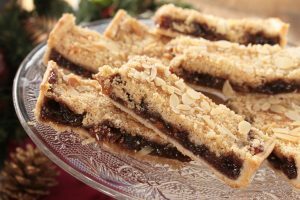 This delicious festive slice can be served warm as a pud with custard, thick cream or brandy butter or simply cool completely and serve instead of mince pies. 1 Sift the flour into a large bowl and rub in the butter with your fingertips until the mixture resembles very fine breadcrumbs (alternatively pulse in a food processor until fine breadcrumbs). 2 Remove 100g of the breadcrumb mixture and cover and chill in the fridge. Stir 25g of the sugar into the remaining mixture, then stir in the egg and water and mix to a firm dough (adding a little more water if needed). Knead lightly then wrap in cling film and chill for 30 minutes. 3 Preheat the oven to 200C/180C fan/gas mark 6. Roll out the dough on a lightly floured surface and use to line a 23cm square tart tin. Prick the pastry all over with a fork. Line the pastry case with baking paper and baking beans and bake for 10 minutes. Remove the lining paper and beans and bake for a further 5-7 minutes until the pastry is crisp and pale golden. Cool slightly. Reduce the oven temperature to 180C/160C fan/gas mark 4. 4 Spread the mincemeat in the pastry case. Mix the rest of the sugar and the ground almonds into the reserved pastry crumb mixture and scatter over the mincemeat to cover completely. 5 Return the tin to the oven and bake for a further 25-30 minutes or until the crumble topping is pale golden. Scatter over the flaked almonds and leave to cool before removing from the tin and cutting into 12-14 thin slices. Add some finely chopped toasted hazelnuts or walnuts to the crumble topping for an extra nutty flavour. Previous Post:Billy & Sammie, a brother and sister who need a home…. Next Post:The Great Cover Up!